Can I send single and double layer boards to be panelized on same panel? When you send different boards for panelization you should send them with SAME layers - this means you can mix single and double layer boards but all single side boards should have TOP and BOTTOM layer too (even if there are no tracks there should be pads on the single layer PCB) and ALL boards from the panel should have SILKSCREEN on same side, i.e. you can't mix boards with top and bottom silkscreen and ask them manufactured on panel with one side silkscreen! Can I send you several small board files which to be panelized to one of your panels? Yes, but we will charge you EUR 5 per each next board on the panel after the first one. i.e. if you send us 3 boards to be panelized in the same panel you will have to pay EUR 10 extra. If you make the panelization yourself there is no panelization charge. When you are sending more than one board file please attach picture how the boards should be panelized. If you do not provide panelization drawing picture we'll try to panelize but will charge you additiona fee. Please reffer our PRICE web page for more info. 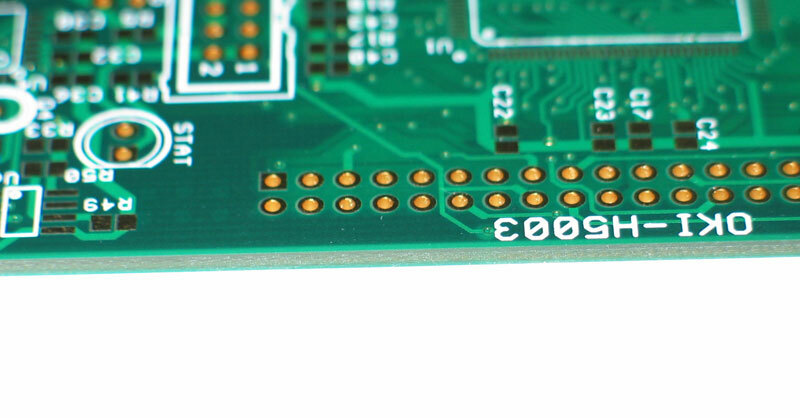 The panelization drawing picture must be in easy viewable format like: BMP, GIF, JPG, PDF and each board on the drawing should have name as the PCB files name you send for it. Please note that we de-panelize the boards from the panel with stright cuts from side to side so this is correct panelization request and this is incorrect panelization request which we can't de-panelize. What should I know when I send many different boards for panelizaiton? Please be careful when you calculate your board dimensions, if you send many boards for panelization and we can't fit them as per your panelization drawing you should send new drawing or remove boards to make panelization possible but we'll not process new files (i.e. you change your board dimensions and send again) without charging re-processing fee. Please reffer to our PRICE web page for more info. I don't want to have border on my PCB, can I have board dimension (outline) = 0? No, all boards should have 10 mils borders on all layers (most important on copper layers). If you want your board manufactured without borders we can't de-panelize them and we can ship to you as panel, so you can de-panelize yourself. Should be border continuous line? What are the de-panelization options? We de-panelize the boards from the panel manually and have two tools for this purpose. Guilotinee - in this case only 10 mils gap is needed between your boards on the panel, but the edges of the board will be rough - see this picture. We can de-panelize very small boards with the guilotinee but if the boards are under 20x20 mm the panel should be 0.8 mm thick as the standard 1.5 mm laminate twists when cut on guilotinee and we can't de-panelize your boards correctly. Abrasive disk - this de-panelization produces very even adges - see this picture, but the disk width is 2 mm so on the panel should be 2 mm between the boards and this leads to worse panel usege. 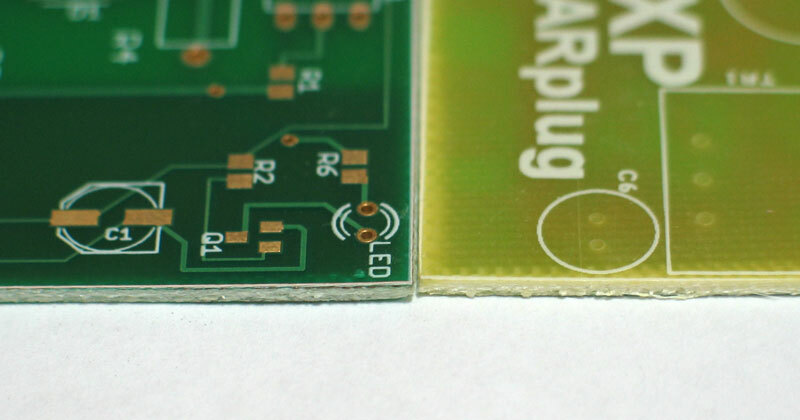 Also we can't de-panelize by disk boards less 20x20 mm. I want to panelize my boards by myself. When I do the panelization is there need for gap between the board's borders? Yes. Please panelize your boards with 0.254 mm (10 mils) gap between outer outside of their borders (NOT between the centers of your board borders i.e. take into account the border line width too!) if you choose guilotinee cut and panelize with 2 mm (78 mils) gap between outer outside of their borders if you choose disk cut. Boards that are panelized must have a minimum border width of 10mils. Please have look at this picture which explains how to place the boards. What are the maximum board dimensions if I want two boards to be panelized on DSS panel? How to calculate my maximum board dimensions if I want to yield 2x3 copies on DSS panel? Can you mill/route, v-score my protos? No milling/routing/v-score is available for the prototypes, but these are available for production runs. How can I panelize my small boards inside Eagle? Customer of ours wrote GREAT Tutorial how to PANELIZE your Eagle boards together in panel.